As soon as you see a Hello packet from a neighbor and the Hello parameters match, you’re adjacent and can start exchanging updates. 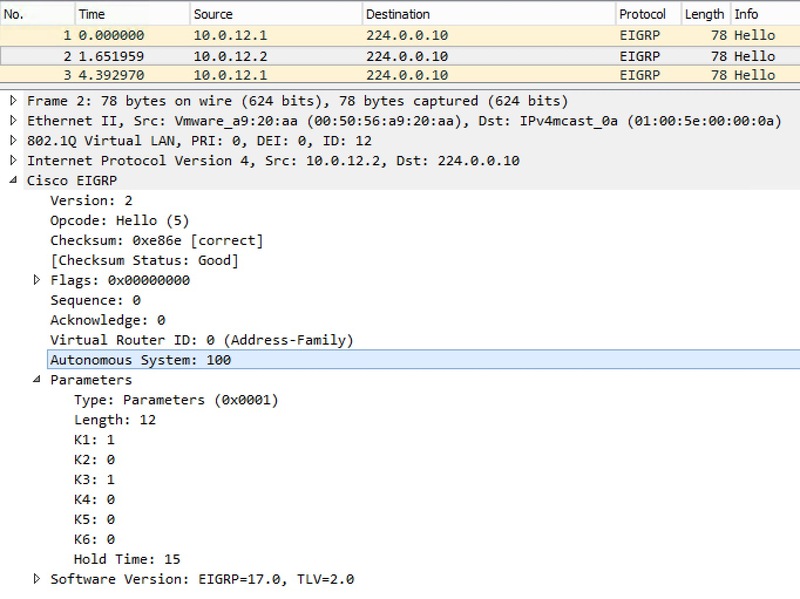 EIGRP uses the link local multicast address 224.0.0.10 to discover and establish neighbors. IANA defines a list of the reserved addresses. This router is in AS 100 and uses default K-values where K1 (BW) and K3 (DLY) is turned on (1). Note the Hold Time does not need to match between neighbors! You should, however, ensure that the Hello interval configured on the neighbor is lower than the Hold Time advertised in the Hello packet. Without jumping to the CLI, we see that R1 will do ECMP for 10.0.23.0/24. What if we wanted to do a ratio of 1:3 where the one part is through R3? Now let’s see the metric that R1 is currently using as a baseline for our calculation. The reason why offset-list is not useful is that this adds to the RD (Reported Distance) and not the CD (Calculated Distance) as we’d like. The current ECMP metric was� 3072. We need to add two times this value to the existing one to reach a total of 9216, which is tree times worse. Same result as changing the DLY on Gi1.13. EIGRP offers a variety of filtering methods. I’ll try to go through them here. Whenever filtering using an ACL or a prefix list with a distribute list, the prefixes you deny are filtered and what ever you permit is allowed. EIGRP can filter the prefix either at the source (originating router) in the outbound direction, or at any other router in the inbound direction. We have the choice of both named and numbered ACLs of either standard or extended type. R4 is redistributing its Loopback0 interface with address 4.4.4.4/32 into EIGRP. So we’ve successfully filtered 4.4.4.4/32 using a standard ACL inbound on Gi1.123 on R1. Note! It is optional to specify the interface on which you receive the update. Prefix lists give the ability to not only match on the prefix, but also the mask of the prefix. This an ACL cannot do with IGPs. You can even specify ranges of masks you want to match on using the ge/le (greater than, equal to/less that, equal to) operators. Very powerful and efficient. Besides filtering using a Route Map matching a prefix list or an ACL, you can also match on metric values (and ranges) and tags. Remember that with Route Maps the ACL or prefix list is just used for matching prefixes, not determine what to do with them. This is up to the Route Map [deny|permit] operators to decide. But like I demonstrated above, I did not need the continue configuration. EIGRP has the concept of internal and external prefixes – like OSPF. 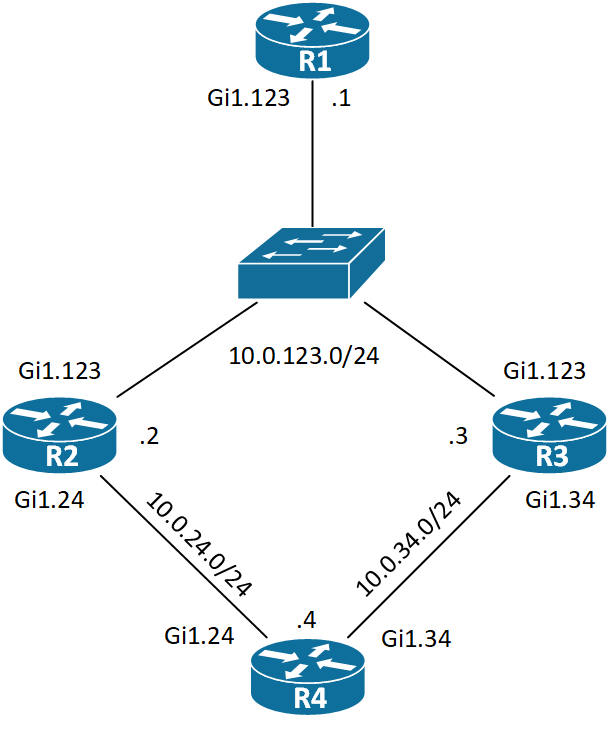 Using the distance command under topology base for EIGRP NM (Named Mode), we have the ability to change the distance – either for all EIGRP prefixes (internal and external) or for a select set of prefixes (internal only!) received from all or some neighbors. We would do this to either prefer using another routing protocol for the same prefix or as a filtering technique for either policies or TE (Traffic Engineering). 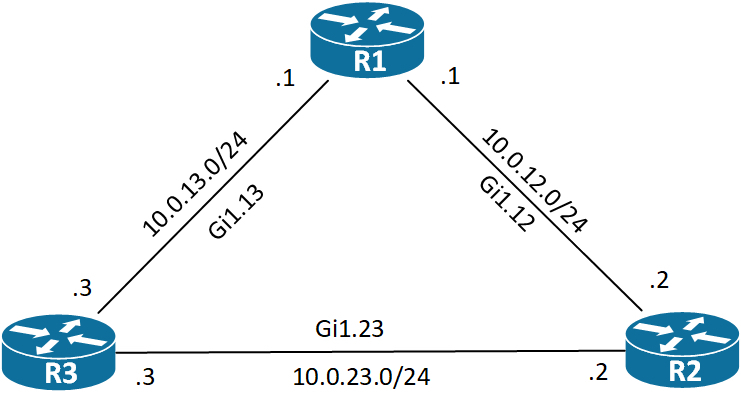 Here the first value is the distance for EIGRP internal prefixes. The second value is for EIGRP external prefixes. An AD (Administrative Distance) of 255 means Unknown (the router does not believe the source of the prefix and will not install it in the routing table). No external prefixes are installed in the routing table, as expected. First we define an ACL that matches the prefix we want to change the distance for. Next under topology base we set the distance to 255 when the prefix is received from a neighbor using a WC (Wild Card) mask if it matches access list 1. Now we only have 4.4.4.4/32 from R2 as we wanted! Excellent. EIGRP has a built in diameter that works a bit like RIP’s infinite metric which essentially is a hop count of 16. The default maximum hop count with EIGRP is 100, meaning that if a prefix has been advertised through more than 100 routers, it must be discarded. You can use this feature to narrow down your network diameter or use it for filtering. Note! This will tear down all neighbors! Although the hop count is not part of the metric calculation, it is configured in topology base using the metric command, because it is a way of measuring the number of hops.